Connect media consoles and other electronics safely and easily with this media chest's wire management. Cord access holes located at the back of the chest's open compartments allow you to connect component wires directly into the wall and hide unsightly cords. Open fronts provide for easy remote access, while the access holes help to circulate air into the compartments to keep consoles from overheating. Enjoy your favorite shows and movies from the comfort of your bed with this chest's convenient and safe wire management. Give your living space an airy cottage or farmhouse look with this TV console. 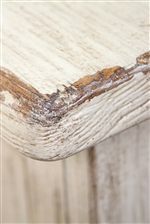 The piece is constructed of poplar solid and ash veneer in a weathered worn white finish that exudes an aged, antique appearance. For storage, you receive two fixed shelves on each end, perfect for housing DVDs or displaying cherished items. Two center beveled glass insert doors house a single adjustable shelf and above that is an open electronic storage area, which can be used for speakers or media boxes. The Aberdeen TV Console with Open Shelving by Riverside Furniture at Ryan Furniture in the Havre De Grace, Maryland, Aberdeen, Bel Air North, Churchville area. Product availability may vary. Contact us for the most current availability on this product. 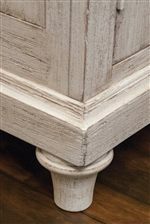 The Aberdeen collection is a great option if you are looking for Cottage Cottage Cottage furniture in the Havre De Grace, Maryland, Aberdeen, Bel Air North, Churchville area.